A Conference-Only package is available for those who prefer not to stay overnight on campus and have arranged their own accommodation locally. Please click on the "Register" button to read more about that package. In much the same way Boulder, Colorado, USA, bridges the diverse landscapes of the Rocky Mountains and the Great Plains, the 2019 conference aims to bridge our diverse cultures, beliefs, and abilities to share in our passion for citizen diplomacy. Located at the University of Colorado, my hope is that participants will leave this conference feeling re-energized in our purpose to create greater cultural understanding and a more peaceful world. What is the status of peace in the world? How can we as an organization make a bolder impression in the world? How can I, a common citizen, make a bolder impression in my community? Highly engaging, interactive, and full of relevant information and tools for you and your club, this conference aims to answer these questions and more. I look forward to sharing this time with you as we continue to learn and grow together. A total of 388 people have registered so far. The following 97 have opted to share their information. Please arrive at the Williams Village Campus (not the main campus!) on July 23 to check into your room and register at the FFI desk. Please have some dinner in the Williams Village Center Dining anytime between 4:30 and 7:30 PM that evening; this is included in your conference fee. The conference opening ceremonies begin promptly at 9:00 AM on July 24. We ask that you please take your seats no later than 8:50 AM. Your conference package ends on July 26 with breakfast in the Williams Village Center Dining, anytime between 7:00 and 9:30 AM. If you are not staying on campus for our optional two-night extension, please check out of your room by 10:00 AM. Those joining us for the extension will check out of their rooms by 10:00 AM on July 28. Please see the registration form for details of the extension and all the activities available for an additional fee. Boulder is located approximately 30 miles northwest of Denver International Airport (DEN). The cheapest and most reliable way to get to Boulder is with Green Ride's shared ride service, which costs $36 each way. Rides take approximately one hour and 20 minutes and run hourly. Pre-book your one-way or round-trip transfer online here. Relive your teenage years on campus! University dorm accommodation at the Williams Village Campus is of a very good standard and is included in your 3-night conference package. 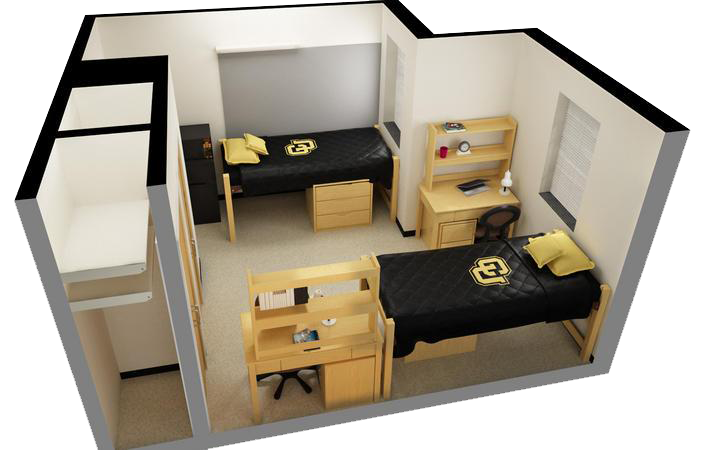 An example of a typical room set-up is shown to the left. Most rooms have two single beds, a desk with chair, dresser, micro-fridge, and air-conditioning. You will also find a linen package on your bed, which includes 2 sheets, pillow, pillowcase, 2 towels, 1 washcloth, bedspread or blanket. Men's and women's communal bathrooms with shower stalls and toilets are on each floor. Please put your roommate’s name on the registration form or indicate if you would like us to match you with one. If you prefer to stay off-campus we are holding a small number of king and double rooms at Boulder's Millennium Hotel. The campus is about a 25-minute walk from the Millennium Hotel, or 20 minutes by public bus. Please contact Debbie Powell at debbie@friendshipforce.org for more information. Those purchasing our full World Conference Package will receive a swipe card for use at the Williams Village Center Dining. The Conference Package swipe card is preloaded for one casual dinner on your own on campus on July 23, breakfast on July 24, 25 and 26, and for lunches on July 24 and 25. The state of the art Williams Village Center Dining has a variety of food stations to suit every taste, with menus selected and prepared by expert chefs. It's all-you-can-eat, so once you've swiped your card for that mealtime, you can select something from the curry station and choose something from the salad station and even a little something from the Mediterranean! You can load more money on your card if you want to use it for other meals not included in our program. We are offering a variety of training workshops on July 24 and 25 to be led by experienced staff and volunteers from around the globe. Attending these workshops is a great way to explore a particular topic in more depth and meet colleagues with similar interests. When you register at our staff desk on July 23 you'll receive a conference program; here you'll find the workshop topics with descriptions and presenter information, along with the start times and locations. Characteristics of an Awe-Inspiring Host Program How to Become a "City of Peace"
Characteristics of an Effective FFI Ambassador What can FFI Regional Support Managers and Field Reps Do for My Club? How to Pack Like a Champ Sharing Journey Experiences: Photography, Stories, Social Media and More! If there is a large enough delegation from one language group, guide sheets for some of the workshops as well as plenary remarks will be provided in that language. Dependent on delegate interest and numbers, workshops in native languages may also be provided. If you are a group of 20 or more people from one language group planning to attend, please contact Debbie Powell to express your interest.